Outlander is a series of books written by Diana Gabaldon. One of the main characters, Claire, time travels from 1946 to 1743. The main focus of the story is the relationship that develops between Claire and Jamie Fraser. The books are historical fiction. However, they include Claire’s interest in botany and medicinal plants, while consisting of mystery and fantasy, romance and war too. As a result they are very popular. Hence the book series is now a major television drama. Especially relevant for me, many medicinal plants are included throughout the story. For followers of the TV show, or the books, some of the uses of the Outlander medicinal plants are highlighted in the following selection of posts. Look for the Outlander heading for specific sections. I have written several articles which have included mints but have not, as yet written a profile solely on mint. There are so many different mints and so much I could write…. Most people recognise a mint growing. Certainly if not by look, by crushing and smelling a leaf. Peppermint and Spearmint are the two utilised medicinally most often. However, there are many others…. The scientific name for peppermint is Mentha x piperita. For spearmint, it is Mentha spicata or, sometimes Mentha viridis. You may also see spearmint called simply garden mint. Peppermint is actually a hybrid between water mint (Mentha aquatica) and spearmint. Incidentally Moroccan mint is also a hybrid of mints, one of which is also spearmint. You will sometimes see it called Mentha spicata ‘Moroccan’ or Mentha spicata var crispa. This is the mint used in the heavily sweetened tea given in Morocco. If you enjoy a mojito, this probably would originally have included the Mentha x villosa mint variety. A hybrid between spearmint and apple mint. Mentha x villosa more commonly is known as Cuban mint. Cuba being the birthplace of the mojito. As a result many mojito recipes utilise the easier to source spearmint. You have probably already guessed… Mints are somewhat confusing. How many mint species are there? Well who knows really. They are a somewhat promiscuous bunch and tend to cross-breed quite easily. Some sources report up to 25 species, while others report as low as 14. Certainly there are hundreds of varieties. The word ‘mentha’ is Latin origin. However, the word is thought derived from Greek ‘mintha’. In Greek mythology, Mintha is a female deity or nymph. Nymphs give life to lakes and rivers, sources of fresh water. Places where the mint naturally loves to live! In fact water mint can actually grow in water. Mint is particularly easy to grow in the garden, though probably best in a pot! A wonderful first aid remedy to have to hand. Grow peppermint or spearmint or a selection of mints if you have space, separately of course! In the first aid article (link above) I mention use for aching feet and as a pleasing digestive tonic tea. And, of course, it is also an ingredient in a winter tea to keep the bugs at bay. As an aromatic water it is a useful cooling spray, particularly for menopausal flushes or hot feet. In addition I sometimes choose peppermint essential oil for patients with sciatic pains. In a Modern Herbal, Grieve suggests peppermint first appeared in an English spearmint crop around three hundred years ago. However, there is evidence of peppermint being cultivated in ancient Egypt. Apparently it was officially added to the Pharmacopoeia in 1721. This was following the identification of many medicinal properties. Utilised in a similar method to smelling salts. Also recommended for the head and memory and as a gargle to cure problems of the mouth. Grieve adds in the fourteenth century, it was believed to whiten the teeth. Possibly it was more beneficial as a breath freshener. Certainly it is a popular addition to toothpastes and mouthwashes today. Bartram adds Dioscorides reputedly wore peppermint on his cloak to raise his spirits. One of the miracle remedies of the four robbers vinegar. Anyone for mint sauce with their lamb roast dinner? Mint sauce has long been an important culinary complement with lamb. Why? Traditionally mint sauce is made with spearmint. Was it chosen for its benefit on digestion? This foodie blog, including the comments section, offers a few interesting theories. I have never used tincture in my own practice. Preferring tea, aromatic water or essential oil. Some of these uses I have mentioned above. A carminative and antispasmodic, it is an excellent digestive remedy. Take the tea for difficulties or pain on digestion – colic, indigestion, IBS, flatulence, abdominal cramps. Relieves sickness and nausea. The menthol in the tea helps clear nasal congestion. Be sure to brew the tea in a covered container to retain the volatile components. The essential oil is widely in use within aromatherapy. Some uses include inhalations for respiratory conditions. In addition, in a massage blend the analgesic properties ease the pain of neuralgia and also in abdominal massage for digestive upset or painful periods. The anaesthetic action makes it useful for ‘cooling’ inflamed conditions. Utilised as inhalation or in massage on temples for headaches. Although, I find mint particularly useful in this instance, if the headache is due to digestive upset, as an abdominal massage. Bartram recommended five to six drops of the essential oil in two teaspoons of massage base oil for muscular aches and pains, stiffness or sport injuries. In Season 1 of the television show and the first book, peppermint makes an entrance when Claire first visits Geillis Duncan. Claire was desperate for a young hungry boy to avoid a severe sentence for theft. She convinced Geillis to speak with her husband. Geillis gave peppermint to her husband for his dyspepsia to make her husband more agreeable to reducing the punishment. I assume she brewed him a peppermint tea here. Energetically peppermint is a herb of Venus. However, I always find it to have a contradictory warming and cooling effect on the body. Most people find small amounts cool and fresh. Finally, some people, generally those of Choleric or warmer temperament, can find mint tea uncomfortably heating. If you are one of these people try spearmint. It is milder in action and often better tolerated. At Castle Leoch Mrs Fitz brings Claire some garlic bulbs, bags of herbs and cloth strips. Claire has Mrs Fitz peel the cloves. Several cloves of peeled garlic with thyme are added to boiling water to decoct. She is making an antiseptic wash for Jamie’s wounds. Claire drops the cloth strips in the boiling liquid too. Okay so Mrs. Fitz, Claire and Jamie are fictional characters from the Outlander book and television show. But is this use of garlic so crazy? Historically garlic does certainly have a long history of medicinal use. However, nowadays Allium sativum (garlic) is the subject of much investigation. Research studies have found our ancestors were right to use garlic. It is indeed anti-microbial. A recently published paper in the Journal of Ethnopharmacology actually looked at historical use of medicinal plants. In particular the study investigated the activity of medicinal plants used by the Physicians of Myddvai from the 14th century. Over 67 historical plants had detectable levels of antimicrobial activity against Staphylococcus aureus (Gram-positive) and Escherichia coli (Gram-negative). One of the medicinals tested was garlic. A study by Roshan et al published in the Journal of Applied Microbiology earlier in 2017 included garlic. They tested twenty products, one of which was garlic juice, against four different strains of Clostridium difficile. In conclusion the garlic juice had the highest anti-microbial activity. Furthermore a later study by Sheppard et al in the European Journal of Medicinal Chemistry, found garlic effective against multi drug resistant Staphylococcus aureus. It is a medicinal I always have to hand. The above are some of the benefits. It has many more uses. I have included some of these in Fight Winter Chills with Herbs from the Kitchen. Well after a long Droughtlander… Season 3 eventually hit our television screens in September. The following is the Outlander Season 3 Summary of Medicinal Plant Remedies. Finally in episode 3 a medicinal plant, milk thistle, enters a scene and Murtagh is back! However, Jamie and Murtagh are in Ardmuir prison and Murtagh is poorly. He has had enough dam thistles. They chat about Claire. Click here to read more about milk thistle or Carduus marianus. Probably, the most eagerly anticipated episode. Claire and Jamie reunited after 20 years. Sweet herbs are most probably aromatic plants from the Lamiaceae botanical family. Herbs such as lavender, rosemary, lemon balm, perhaps mint too. You may remember in Season 2, Episode 2 titled “Not in Scotland Anymore”, Claire visits an apothecary store in France. There she meets and befriends Master Raymond. After discovering Suzette (the lady’s maid) and Murtagh together, Claire returns to the apothecary in Episode 3. As a result, she asks Master Raymond’s help for birth control for Suzette. Master Raymond recommends mugwort. Wow that was a bit of rollercoaster episode…. Claire rushes off to the apothecary for plant medicines to try to save the exciseman from his severe head wound. While there she meets Archibald Campbell asking advice for his sister Margaret. His request is for anything that might calm her nerves. In particular he mentions mandrake root and hemlock. Mandrake root (Atropa mandragora) and Hemlock (Conium maculatum) are out of modern use. Hemlock is sedative to the motor nerves and muscles (Menzies-Trull). In Margaret’s case, her brother Archibald, probably heard of its use for excitability and mania. Hemlock is on the poison schedule. Mandrake root had many traditional uses. Also believed sedative. Podophyllum peltatum is the American mandrake. A different species. I understand this is digestive in action. For the exciseman, Claire purchases a bottle of laudanum, some ground yarrow root and tormentil. Claire would select laudanum, opium based, as a painkiller. Herbalists today prefer the aerial parts of yarrow (Achillea millefolium) rather than the root. It is astringent so Claire probably would have decocted the root to use to reduce bleeding. In addition, tormentil (Potentilla tormentilla or P. erecta) is also an astringent wound healer. It is high in tannins. Thereafter, upon returning to the brothel and the ailing exciseman, she tries her hand at trepanation! Although Claire successfully releases the clot the exciseman inevitably ends up Crème de Menthe! Later Claire visits Margaret Campbell. Her brother had given her a few drops of laudanum to keep her calm prior to Claire’s arrival. Poor Margaret certainly is very sombre, at least initially! Margaret has trouble sleeping and has nightmares. She sits staring at the wall. Claire diagnoses a mental disorder. She recommends mistletoe tea with a few drops of tansy oil. In addition she proposes valerian tea to help her sleep. Finally she insists no more laudanum! Claire would have recommended the combination of Viscum album (mistletoe) and Valerian officinalis (valerian) for Margaret’s nervous disposition. Mistletoe is a sedative and tonic for anxiety, nervousness and panic attacks. Valerian is a muscle relaxant and sedative for anxiety, nervous tension and excitability. Both herbs very much still in use by herbalists today. Keen Outlander fans may remember Claire gave Angus her port which included valerian. This was the episode titled The Gathering and before her marriage to Jamie. She planned to make Agnus sleepy. Unconscious he would miss her escape from Castle Leoch. Fortunately she tripped over a sleeping Jamie in the stables before being able to steal away with a horse. Well I have been avidly watching Outlander Season 3 waiting for some of my medicinal friends to arrive. I know many are longing for the print shop reunion of Jamie and Claire. I, however, was beginning to wonder if we would ever hear from the plant world in Outlander again. Finally in episode 3 Jamie gives Murtugh milk thistle and they discuss Claire, though not by name. Jamie is using mashed leaves and stems. Murtugh is poorly with a chronic cough. His skin is broken. He has been bitten by rats. They are in prison. Traditionally all parts were utilised medicinally. These were eaten raw or boiled. Modern use tends to use the seeds. It is a fairly obvious looking thistle flowerhead. However, it is easily identified from other thistles by the leaves. Native to the south west of Europe and introduced to northern areas. In the British Isles its appearance decreases further north although it is found along the east coast of Scotland. It can be found growing on waste ground and cultivated grounds but seems to prefer the coast (Barker). Coombes believes the scientific name means Our Lady’s Milk Thistle. This relates to the Virgin Mary said to have dropped milk on the leaves causing the white mottling. Leading on from the discussion above of traditional versus modern plant part used I thought I would compare and contrast the usage. Culpeper chose milk thistle to prevent and cure infection of the plague. He described milk thistle as opening obstructions of the liver and spleen and useful for jaundice. In addition, he believed it provoked urine and could break and expel urinary stones. Incidentally he utilised the seed in distilled water. In addition to internal use he applied externally with sponges or cloths to the liver area or the heart area to cool. Another recommendation was to boil the plant having removed the prickles to avoid choking on them. This he believed was an excellent blood cleanser. Moving forward to Mills he advised traditionally widely used in Europe to stimulate the flow of milk in nursing mothers and also as a general digestive tonic. However, he states that in more recent years following extensive research in Germany, the herb has increased in popularity for liver disorders. It appears the uses for liver in Culpeper’s era dwindled. Thereafter, for a period of time, considered more of a bitter remedy. That is until more recently, re-discovered by modern research. Traditional use for expelling urinary stones appears to be a thing of the past. Modern day herbalist Mills describes milk thistle a galactogogue, digestive tonic and specifically a liver protector. While Menzies-Trull describes the key actions as hepatic trophorestorative, cholagogue and choleretic. Menzies-Trull indicates the herb for varicose veins, to reduce biliary cholesterol, for hepatitis, jaundice, spleen enlargement, pruritus (itchy skin), haemorrhoids, and alcohol abuse and for the fatty liver of cirrhosis (action of the constituent silymarin). In addition he recommends milk thistle for dermatitis, eczema, psoriasis and ulcers. Menzies-Trull’s recommendations for the skin seem to link in with Culpeper’s belief in using the herb as a blood cleanser. Interestingly, David Hoffmann recommends, in combination with other herbs, for hyperactivity in children. He adds as chemical irritants such as pollutants (heavy metals) or artificial food additives (colourings, flavourings) have a role in hyperactivity, aiding liver detoxification is essential. I do find milk thistle of enormous benefit in liver conditions. I have used it combined, with other herbs, for menopause. Too many wandering hormones, itching skin, general liver-ishness and lethargy. However, I sometimes prefer dandelion depending on the patient. I have also prescribed in tincture or decoction for haemorrhoids in conjunction with an ointment for external use. Useful in a herbal blend for headaches caused by digestive upset too. This includes those caused by partaking in a little too much alcohol! The use of the plant as a bitter rather than specifically for the liver I find intriguing. I personally find the taste sweet rather than bitter. I most often use fresh plant tincture. I have found it easier for patients. Occasionally I have used decoctions. Barker asks his patients to powder the whole fruits in a coffee grinder and sprinkle into a glass of water. One of my tutors, I believe if may have been Maureen Robertson, recommended grinding the seeds and adding to porridge. I particularly like the above two seed preparations. However, I have found, in practice it is often impractical for most patients. Alternatively Barker suggests an infusion of the powder or a decoction of the whole fruits. If tincture preferred Barker recommends 2ml three times a day of a 1:5 in 25% alcohol. For tincture use I personally prefer 45% alcohol. Approximately 3% of milk thistle is the constituent silymarin, a flavanone lignan. A known anti-oxidant (Menzies-Trull). He describes the herb as having an ability to increase production of hepatocytes and to stabilise the outer membrane of the hepatocytes which thereby increases antioxidant levels by 35% aiding the liver in ridding the body of free radicals. Phew! He believes it also increases liver enzymes and blocks the release of histamine. This would suggest a possible use in allergic reactions. Silymarin stimulates liver cell regeneration. Used as a liver protector and in treatment of liverish conditions like hepatitis and cirrhosis. No known side effects. A safe herb to use for pregnant women, as well as children and the elderly (Chevallier). Clinical data supports use in treatment of acute or chronic hepatitis and cirrhosis induced by alcohol, drugs or toxins (WHO Monographs). Culpeper described milk thistle a temperate herb. This generally means it is closest to our own body. I believe this highlights the general safety of this particular medicinal ally. Culpeper associated this herb with the plant Jupiter with a cooling effect externally. However, Tobyn describes Jupiter hot and moist. Perhaps milk thistle works by drawing the heat thereby providing the cooling effect. Tobyn also notes Jupiter specifically acts on the blood and liver relating back to Culpeper’s use as a blood cleanser and his indication for liver obstructions. It is also specific to the sense of taste, once again being hot and moist. Doctrine of Signatures links the leaves, breast milk and the galactagogue action. The galactagogue use may well explain how the plant got its name. A very useful medicinal ally even though Murtugh has clearly had enough of those dam thistles! And so to this website’s namesake! 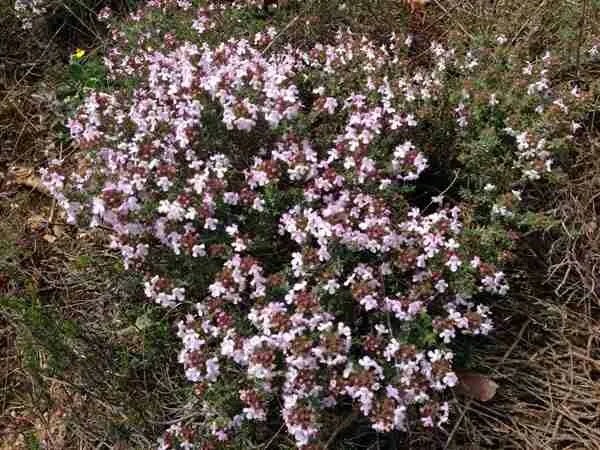 During the month of May, the hills around the Aude are covered with the stunning colour of the beautiful thyme flowers. The aroma is luscious. Bremness describes a woody stemmed, highly aromatic shrub requiring sun and a light, well-drained soil. She notes it more commonly found growing in the Mediterranean. Although Greive notes most countries with a temperate climate now grow thyme. 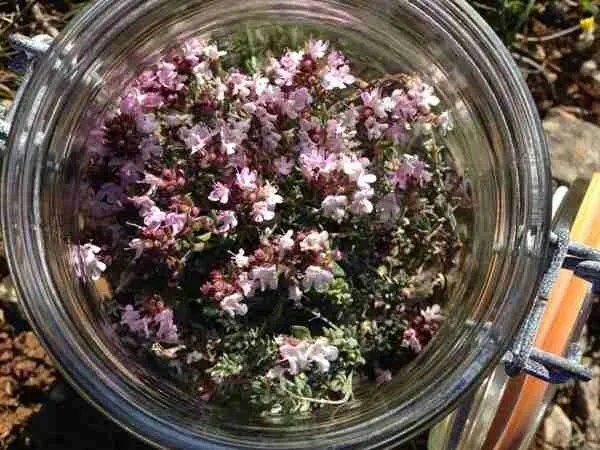 Thyme has a lengthy medicinal and folkloric history. Grieve tells of it being one of the flowers forming the fairies favourite playgrounds. In mediaeval times, it was utilised for invigorating and antiseptic properties. The Romans reputedly used it as flavouring for cheese and liqueurs. Found in the tomb of Tutankhamen. Ancient Egyptians reputedly used thyme to treat headaches and intestinal complaints (Maniche). Culpeper also used thyme for headaches (see energetics section below). According to Culpeper thyme killed worms in the belly, expelled wind and ridded the body of phlegm, strengthening the lungs. For children he recommended its use in the disease chin-cough. Thyme is strongly antiseptic (Hoffmann). Hoffmann recommends use as a gargle for sore throats, irritable coughs, laryngitis and tonsillitis. He describes further use for the respiratory tract for cases of asthma, bronchitis and whooping cough. Could whooping cough be the chin-cough from Culpeper’s time? Weiss actually lists the plant within the respiratory system of his book. He highlights similar actions to Hoffmann adding its use for patients suffering from emphysema. The action on the respiratory system, especially the lungs, appears to be the main property as Mills too includes it in his list of expectorant herbs. However, Mills also describes an antiseptic effect on the urinary system and an antispasmodic and carminative effect on the digestive tract which is probably why thyme is such a popular culinary herb. Thyme is also cited by Bartram as being useful for infections of the respiratory and urinary tract and for bedwetting children and overwork. I find dried thyme a very pleasant winter tea to fight off those winter bugs. To me part of the healing process is inhaling the lovely aroma of the brew. If you are not keen on the taste of the tea consider using in a foot-bath (see below). Even with a foot-bath you would still benefit from that luscious aroma. Bartram contraindicates use in pregnancy although I have found no support for this claim other than the traditional eclectic physicians believing the herb to be an emmenagogue. The World Health Organisation note safety of thyme preparations during pregnancy or lactation has not been established. Curtis suggests care with the essential oil as it can have an irritant effect on the skin and mucous membranes particularly if high in thymol or carvacrol. I personally wonder if the pregnancy concerns were originally raised due to use of essential oil rather than the actual herb. Particularly where the thyme essential oil may be high in phenols. The phenol constituents, such as thymol or carvacrol, would naturally be more highly concentrated in the essential oil. A volatile oil is the primary principle with bitters, saponins and tannins making up approximately 10% (Weiss). Mills also includes flavonoids. Saponins have a pharmacological effect on the respiratory system and bitters on the digestive system. Flavonoids are antispasmodic, anti-inflammatory and some are anti-tumour. Thyme oil found to inhibit several different fungi and negative bacteria. The volatile oil contains monoterpenes, thymol and carvacrol (Mills). Monoterpenes are generally antiseptic, bactericidal and antiviral. Some are also analgesic, expectorant, decongestant and stimulant. Phenols (thymol and carvacrol are generally antiseptic, anti-infectious, bactericidal, stimulating to the immune system, activating healing and stimulating to the nervous system making them effective in some depressive illnesses (Clarke). This study is interesting as it chose to look at the anti-spasmodic and analgesic actions in relation to painful periods. A clinical study conducted on 84 university students with primary dysmenorrhea. Students randomly assigned to three groups. They all received capsules and did not know which group they were in. Three groups split to receive: thyme essential oil, ibuprofen or placebo. Pain intensity identified with a visual scale. Checked before and one hour after each dose for 48 hours after starting medication. Data collected and analysed. Both thyme and ibuprofen were effective in reducing pain severity and spasms (Salmalian et al, 2014). In the first book, on arrival at Castle Leoch, Claire boils thyme with garlic cloves. Cloth soaked in this solution makes an antiseptic bandage for Jamie’s wound. In the herb garden at Castle Leoch it is mentioned again. Mrs Fitz asks Claire to plant garlic between thyme and foxglove on the south side of the garden. Culpeper described thyme as under the dominion of Venus and under the sign of Aries. Many of Culpeper’s uses have already been mentioned above. The astrological virtues Culpeper believed chiefly appropriated thyme to the head. He said anointing the head with thyme vinegar stopped pains thereof! These recipes are from the famous French herbalist Maurice Mességué.